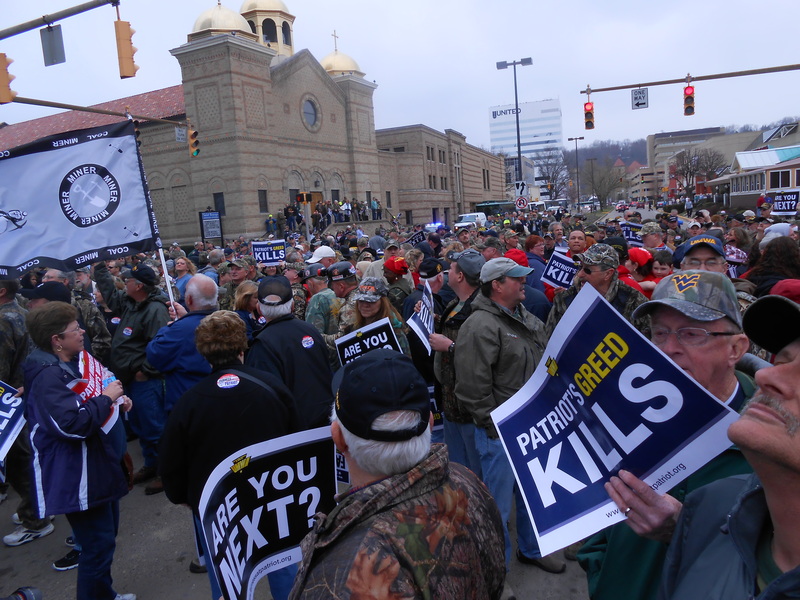 Flashback: The day after Easter Sunday I was in Charleston, WV, marching with the UMWA (United Mine Workers of America). They had been locked in a battle for quite a while to protect the health and pension plans of retired miners. I was there not for political reasons, but for moral reasons. Men and women who had worked for decades at a dangerous and difficult job, are now threatened with losing the very things for which they had worked, while the companies they helped build walk off scott-free. To take the best years of a person’s life, use them for corporate gains, and then toss them aside when they are old and no longer able to work is unethical and immoral. It goes against everything my faith has taught me we should do. I went to Charleston as a minister, to stand with the UMWA, and to make a public statement by my presence that the faith community is standing with our communities’ elders. At that same time, I was searching for a way to continue building my discipleship throughout the Easter Season. It always felt too abrupt to suddenly end the forty day Lenten period of fasting and penance on Easter morning. I knew that I needed to continue working on discipleship in the fifty days of Easter. It was at that march that I realized silence was no longer an option for me. I needed to live out loud. It was no longer enough to support a cause from my living room… I needed to do what Jesus would do, and I needed to be in the streets, demanding justice. I needed to take a stand for the people I promised Christ I would love in his name. I needed to live out loud. As Easter began to wind down, I knew that God was leading me to continue this path of discipleship into and beyond Pentecost. That’s when things came full-circle. 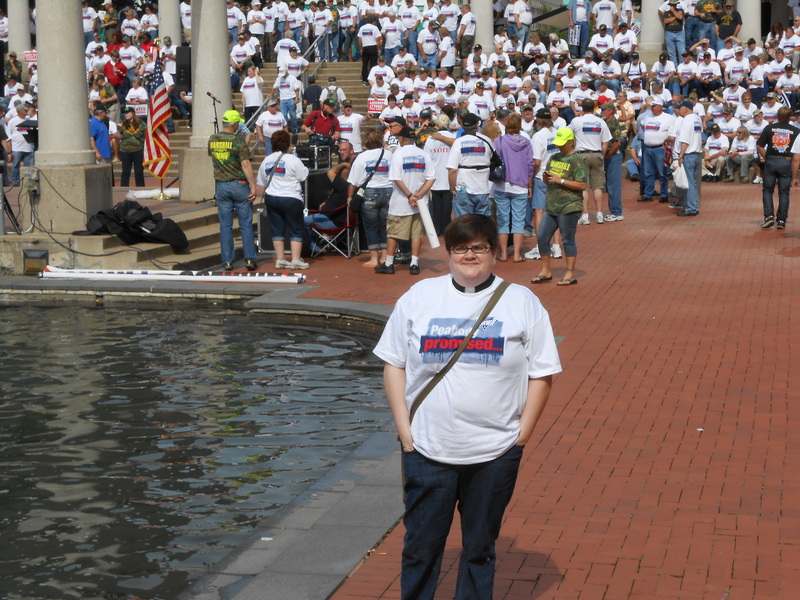 Me at the rally at Peabody Plaza, St. Louis, Mo. However, God’s call for me to live out loud had brought me into a closer relationship with the UMWA in their struggle. I had been asked, and agreed, to serve as Local 1570’s Auxilary chaplain. 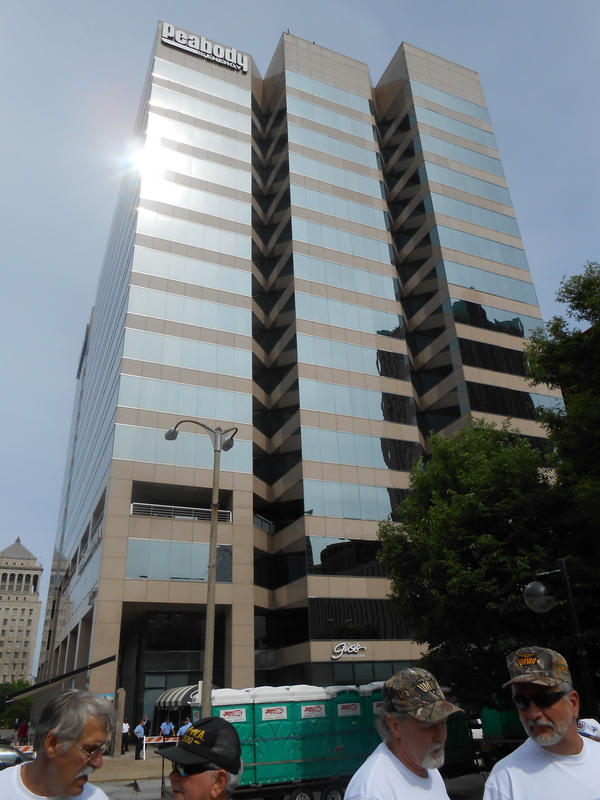 I had been invited to join the UMWA on a bus trip to St. Louis where a rally would be held at the Peabody headquarters followed by a march to the federal court building where the Patriot Coal bankruptcy hearings are being held. Peabody Tower, St. Louis, Mo. 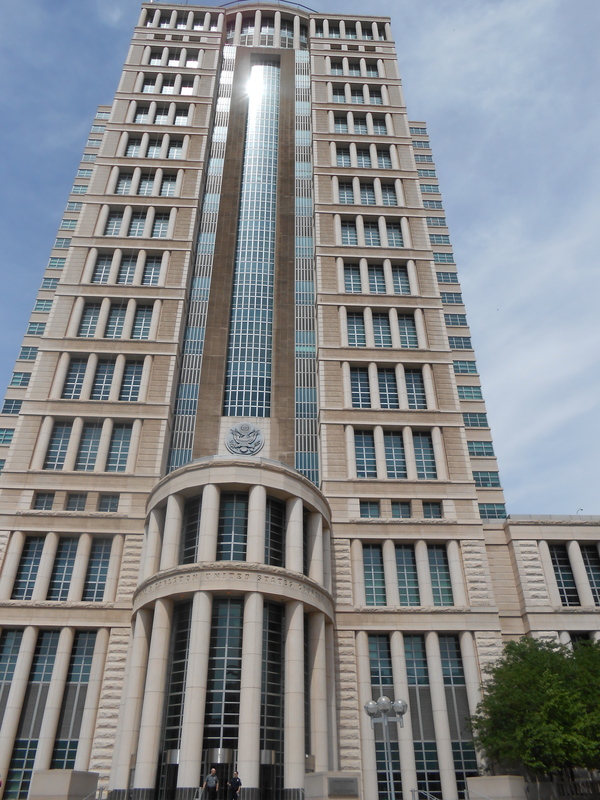 Federal Court House, St. Louis, Mo. What had changed was not the struggle… it was me. Fifty days of living my faith boldly had forced me to step out of my comfort zone. I could no longer hide in the background, worried that being louder might accidentally offend someone or make someone I cared about angry. Living out loud forced me to set myself aside and to live only in the image of Christ. So, when I would have a conversation with retired miners (some of whom attend my churches), I heard the worry in their voices. I heard the concern that after all those years crawling around in the belly of the mountain, that now they will not be able to provide for their spouses or become a burden to their children or their community. And I knew what Jesus would do. There is no way Jesus would just turn and look away when people are being treated unjustly. There is no way Jesus would shrug off the welfare of retired men and women. So… fifty days after that first march, as I stood with the UMWA all over again, I looked around me and realized that God was teaching me another important lesson. It began in Lent with acts of self-denial– a chance to set aside all of those things that distract us from fully following Christ and seeking forgiveness of our sins so that we are ready to see Jesus in all his glory on Resurrection Day. And during Easter, God had called me into living out loud–something that sparked a drive deep in my soul to see Christ’s justice served and a willingness to set my own desires aside so that Christ’s light could shine through me. Which brought me to Pentecost and then to St. Louis, where I saw a steadily burning fire in a lot of good men’s and women’s souls. 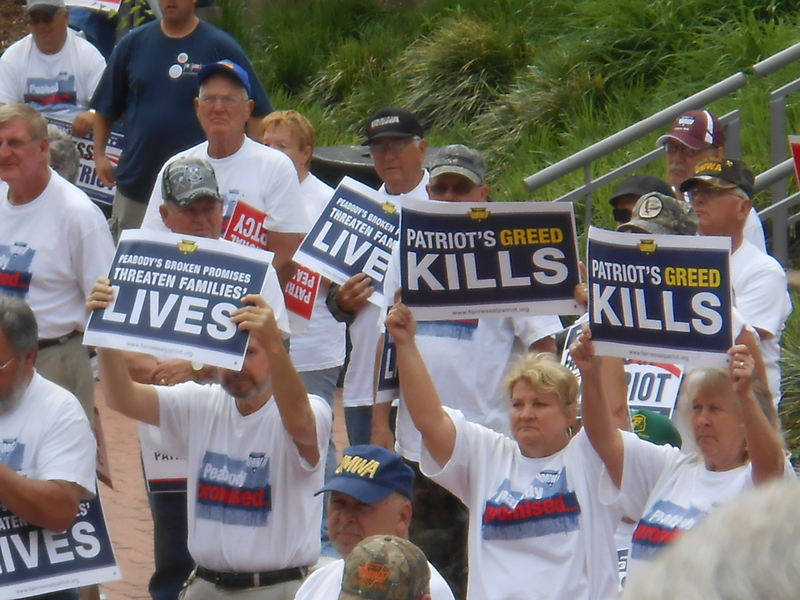 UMWA Rally, St. Louis, Mo. They were there fighting for a righteous cause. Of the people there, many were retired miners, many struggling with the ailments of old age that miners know too well: worn-out backs, black lung, joint deterioration, cancer, etc… But others were representatives of other unions who feared the same thing could happen to them in their old age. The Physicians for National Healthcare showed up, as well. The faith community was well-represented. Lawmakers and politicians were there, of course. And the FOP (Fraternal Order of Police) sent their support, too. This was an important endorsement since several of the marchers were going to engage in an act of civil disobedience that would get them arrested–the very same police who were going to put the handcuffs on peaceful protestors wanted us to know that even though they have a job to do, they stand in solidarity with us. Alabama man getting a helping hand. There were UMWA representatives from all over. I marched alongside a group who had come from Alabama. 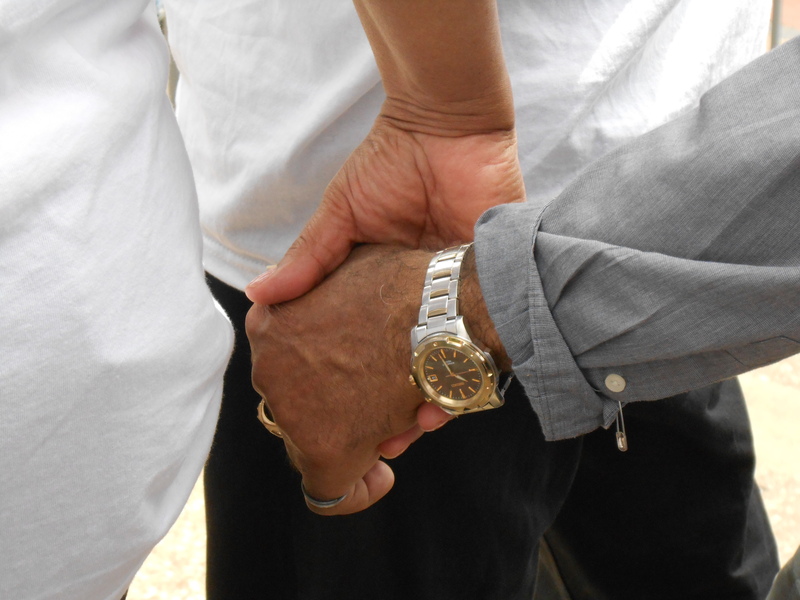 They were all retired–one old man needed help every step of the way, but he marched. Another had just had surgery and was making the march with great caution… but he marched. Bill and Brenda marching in St. Louis, Mo. 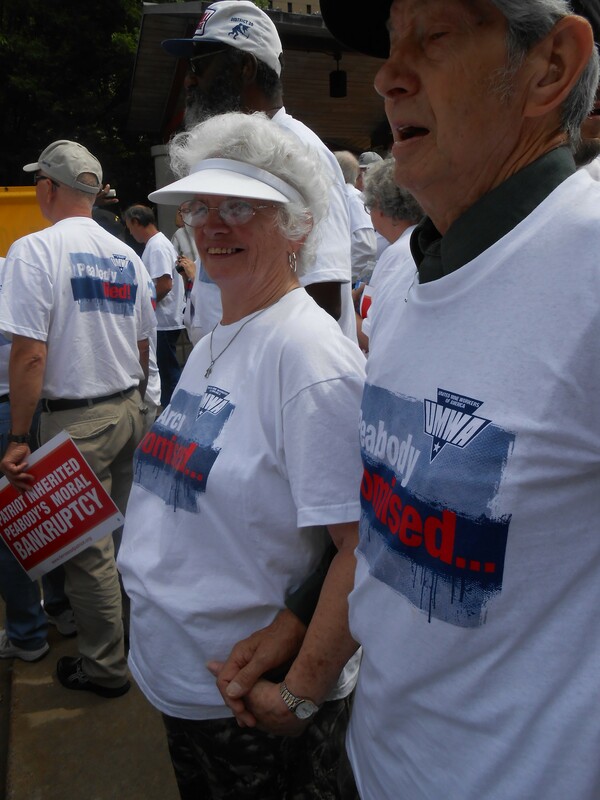 And I was marching with two members of my church, a couple who has been married for 53 years. He is a retired miner. Together they have raised a family, watched their son follow his father’s footsteps into the mines, and have endured many struggles and came through them stronger each time. And it seems so wrong that they are being asked to spend their retirement fighting for something they earned so long ago. I’m not sure what I expected the day after Easter, when I committed to living out loud for God for the remainder of the season… but one thing is for sure, God has been guiding me every step of the way. Thank you, Lord. Thank you for fifty days that haven’t always been easy, but have always been with you. Although I can’t see where the path will take me, I know that it begins and ends with you. Guide my ever step, God, so that I am always walking with you. Amen. I always enjoy reading your blogs, but this one hit close to home. Thank you!